We are recommended by guide ROUTARD Hotel Castilla Guerrero is your hotel to stay in Malaga: on holidays, business, relax. All our rooms are provided with bathroom, television with remote control, air-conditioning or heating. Very clean room-nice bathroom facilities. Very handy to the city and buses. Taxis right outside and train station 10mins away. Very clean, fantastic location close to the harbour along with the town center but nonetheless in a quiet component of town. Near to all bus and train stations. really warm and friendly staff. It&'s a great location to stay. Nice location, warm and friendly staff, clean. It&'s all i needed for my stay. Hotel Castilla Guerrero was a luxury after other places I've stayed. It was great to have a nice room in the city center of Malaga during my stay. The hotel is not far from the majority of Malaga's sights so sightseeing was a lot easier. I also loved that there is a coffee shop right below. Hotel Castilla Guerrero was a luxurious right after other places I&'ve stayed. 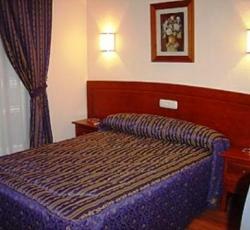 It was fantastic to have a nice room in the city center of Malaga during my stay. The hotel is not faraway from the majority of Malaga&'s attractions so sightseeing was a lot easier. I also loved that there is a coffee shop right below. * Hotel Castilla Guerrero rated 4.1 out of 5 based on 10 customer reviews. Hostel reviews with a star rating are sourced from HostelBookers. If you find Hotel Castilla Guerrero with the same booking conditions at a lower rate somewhere else on the internet after you have booked, we will refund you the total difference.